Your book: Everything Reiki is required reading for my students. It’s a wonderful book. I looked for years for a book to replace Essential Reiki because of some sensitive issues in that book, etc. I own a store, and I reviewed every Reiki book that was printed and–Finally you wrote a book and I was thrilled. All my student[s] love your book. Thank you so much. I was recently attuned to Reiki II and treated myself to The Everything Reiki Book. I have found it to be the most thorough reference on the subject that I have found to date. I’m delighted to have it in my Reiki library and look forward to sharing it with others. The Everything Reiki Book serves not only as a perfect introduction to Reiki for those who are new to the subject, but a comprehensive handbook for students and practitioners alike. The book is clear, simple and straight-forward, yet contains a depth of understanding and wisdom. It really does cover everything to do with Reiki – just reading through the table of contents reveals the complexity of topics which have become associated with what started out as a very simple teaching. Desy has managed to give a birds-eye view of the whole subject, as well as practical details and down-to-earth advice on every topic covered. She states that Reiki is all about balance, and she demonstrates this perfectly as she deals with various issues in the Reiki community, including controversial ones, with a balanced perspective. Desy makes it clear what is unique to Reiki as opposed to other energy healing systems. While her deep appreciation and enthusiasm for Reiki are clear, she acknowledges that being able to use universal life energy for healing is not exclusive to Reiki. She even includes a chapter on other energy-based modalities. One can substitute the term “energy healing” for “Reiki” in many places throughout this book and find that the same principles hold true. Thus the book is valuable for students of any energy healing modality. I love getting Reiki treatments, and wanted to study more about Reiki, maybe even become a Reiki healer myself eventually. This book was such a wonderful way to start my research, because it really does cover all the questions I could have about Reiki. It’s easy to read, easy to understand, friendly, and I really like the writer’s tone and her gentle style. I would recommend this to anyone who wants to learn more about Reiki, whether it’s on the receiving or giving end of this wonderful healing energy and life force. I have a veritable library of Reiki books and this one leaps over the mass of them. It’s an incredible book. It answers just about every Reiki question that might come up in a practice, for beginners and well-established practitioners. Consider it sort the Physician’s Desk Reference for Reiki people, answering such questions as standard rates to charge and the pros and cons of various types of attunements. But it also covers all the basics, from hand positions to explanations of the branches of Reiki. In short, it really is an “everything” book about Reiki. It really lives up to its name. But it also goes beyond that. It manages to explain Reiki in a way that people who aren’t familiar with it can understand, as well as give experienced practitioners advice and “nuggets” of information they might not have found without quite a lot of research. If you have a loved one or friend who wants to know “Just what is this Reiki stuff, anyway?” you can refer them to this book without a lot of esoteric language or nebulous ideas. Like I said, it’s really incredible. A great piece of work. This one definitely goes in my list of suggested reading. With a star! The authors’ standard of excellence shines through in this book. She’s infused it with the Reiki “love” energy she writes about. One can feel it by just picking up the book. I highly recommend this for not only the beginner, but also as a valuable reference for the more advanced student. I especially like the many view points presented. It makes Reiki accessible to everyone. 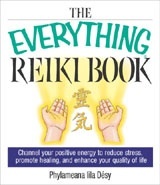 Every Reiki Student of mine is gifted one your “Everything Reiki” book when they take my Reiki 1 Certification class. The Rhode Island State Nurses Association has approved my Reiki 1 class for 8 CEU’s and Reiki 2 for 10 CEU’s. This is a really big accomplishment for Reiki and the Medical Communities to work together. As a Master Shaman and Doctor of Divinity I Thank you for printing such a wonderful book which teaches such a blend of many modalities. You are truly a Gem, keep up the good work. I am reading your book, “Everything Reiki.” It is so great! I love it. I keep skipping around, but am trying to take it a page at a time. I have lots of books on Reiki, but your book just may be the best. I keep reading to my husband from it, and now he wants to be attuned!! I feel he is a natural healer.Thank you so much for writing this wonderful, beautiful book.